for promoting this very good cause! 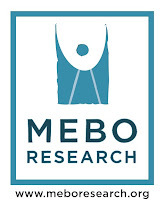 Since MEBO Research is a wholly volunteer Charity registered in the United States and in England and Wales, donors can rest assured that 100% of their donations will go directly to the cause of supporting international sufferers cover shipping cost of their kits.﻿ Donations will not only help fellow sufferers participate in testing, who otherwise would never get the opportunity to test, but at the same time, they will help contribute to the cause of pursuing the most diverse data possible to give greater value to the research study we are undertaking.﻿ They will make a difference for the recipient and the community as a whole. Donations will help to enrich the Gut Microbiota grant funded research with interesting data from a diverse pool of participants. It will go 100% towards that, since all labor involved in the study is volunteer. Donations are helpful in allowing the Principal Investigator, Irene Gabashvili, PhD., MEBO's Scientific Director, to select participants based on their qualifications as opposed to their geographic location. In the end, this better participant selection opportunity will provide valuable information that hopefully will bear greater understanding of the various causes of odor/PATM conditions, which is the first step towards determining targeted precision treatment.